"A favorite with Swedes in our Swedish organization - creamy on top and dense on the bottom. Serve with whipping cream and/or sweetened berries, if desired." Bring water and rice to a boil in a saucepan. Reduce heat to medium-low, cover, and simmer until the rice is tender and liquid has been absorbed, 20 to 25 minutes. Preheat oven to 325 degrees F (165 degrees C). Grease an 8-inch square baking dish. Stir milk into rice until evenly combined. Mix eggs, sugar, pudding mix, butter, vanilla extract, and salt into rice mixture; transfer to the prepared baking dish. Bake in the preheated oven until a knife inserted in the pudding comes out clean, about 1 hour. 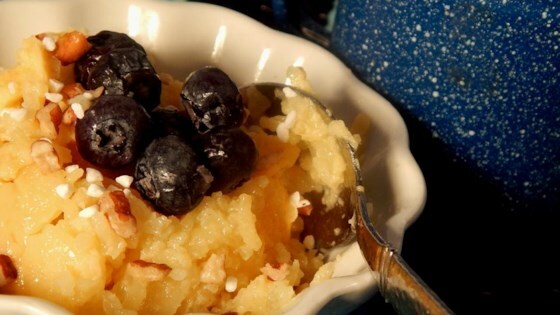 Delicious rice pudding that is so simple and easy to make! Almond extract can be substituted for the vanilla extract. For a creamier pudding, cook in a water bath. Set pudding dish into a baking pan. Add hot water to the pan until it comes halfway up the sides of the baking dish. Set in oven and cook as directed. Perfect! Eggy and sweet by not too much. Serve w while milk or whipped cream and cinnamon. I added raisins before baking.